Decades make great sales tools. Kennedy used a decade timeframe to sell American on the moon in 1961. Robert Zubrin recently tried the same pitch and called for a manned mission to Mars by the end of a decade (Zubrin’s been pitching a decade-long manned Mars program since the 1980s to no avail). A decade is a nice round number, and when you’re at the start of a decade – like the year 1961 or 2011 – people (namely Congress and taxpayers) can easily contemplate the end of a decade as a timeframe. But it isn’t only large-scale manned programs that use a round decade as a sales tool. Recently, the National Research Council’s Committee on Planetary Science in cooperation with NASA released an outline of its planetary goals for the coming decade. 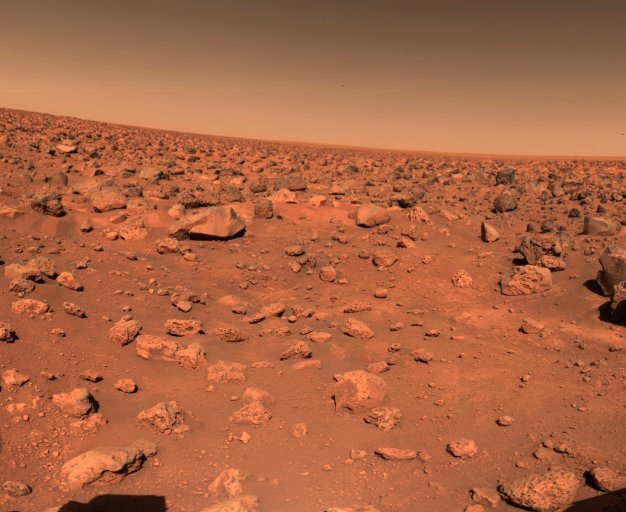 Where Mars in concerned, there is a pretty impressive program in the works from 2012 to 2023. But unlike the moon landing, bottomless funding isn’t going to achieve the goals at any cost. Instead, the next decade on Mars (pictured) will face certain challenges to meet the decadal goal. The search for life on Mars is broken into three main questions: was there life on Mars, where was it and how did it form, and how did Mars’s shifting conditions affect this life? Alternatively, if these missions fail to turn up any concrete evidence of life on the red planet, the question will become why life never arose. Whatever the answer, or answers as the case may be, the method involves a sort of biological reverse-engineering of Mars’ history. A thorough understanding of Mars’ history including the planet’s climate, environments, orbit, rotation, and axis tilt all impact how and where scientists search for life. To this end, NASA has developed a series of missions over the next decade that will not only further our understanding of Mars and its history, but culminate in the first sample return mission. To do this, a mission must launch to Mars at every opportunity – launch windows to Mars come roughly every 26 months. This plan calls for five missions, one each launch window which arrives roughly every 26 months. 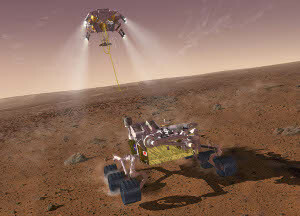 Curiosity will also apply more sophisticated instruments to the overall scientific goal of exploring and assessing Mars as a potential habitat for life, past or present. It will used ten different instruments on the surface as well as a rock and soil sampling system. Together, these instruments will be able to detect and study specific targets both in situ and remotely, as well as collect and analyze surface material. In 2014, another missions will go to Mars. This time, an orbiter will be sent to the planet with the sole goal of measuring the escape rate of Mars’ remaining atmosphere. Results from this orbiter will give scientists an idea of what kind of atmosphere Mars had in its early life and when it started to escape. This will also give an indication of when in Mars’ history the planet had the best environment to potentially harbour life. 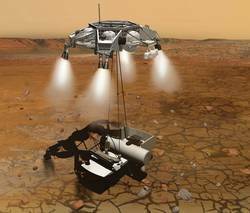 In 2018, a NASA will send two rovers to Mars – one American and one European. Both will land together at the same sight but carry different science payloads. 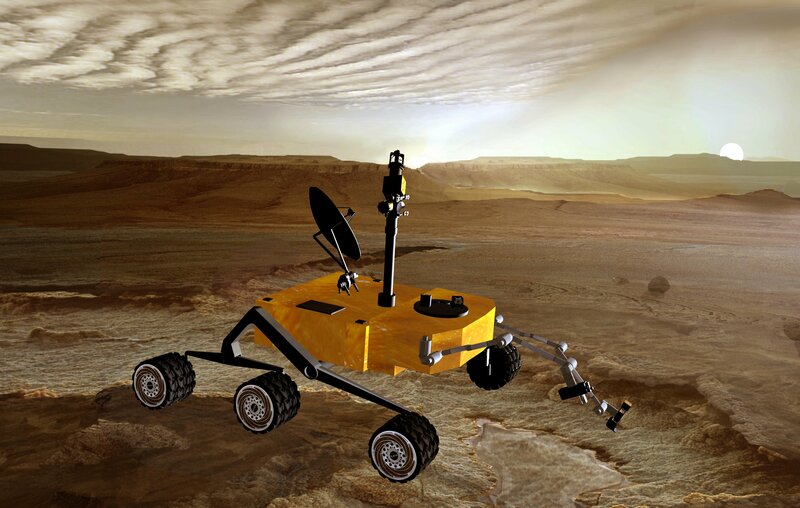 The ESA rover will carry a drill and a suite of instruments for exobiology and geochemistry research while the NASA rover will collect and store samples. This will mark the beginning of the sample return mission – the 2018 rover’s collected samples, each roughly the volume of a Bic pen, will be those that make it back to Earth. The sample return mission will be done in segments over three separate missions, essentially allowing redundancy and a holding period into the mission in the event of a schedule slip or loss of funding. Ultimately, a better and more thorough understanding of Mars’ history will make planning and executing a manned mission that much simpler. It’s impossible to develop technology for a manned mission without knowing as much about the surface, weather, and atmosphere as possible. But the cracks are already forming in this plan. MSL was originally intended to launch in 2009, forcing a reevaluation of the capabilities and realities of long-term Martian goals. A slipped launch is a recoverable setback. More problematic is the budget constraints facing NASA. The JWST program has already been close to cancellation, and its plausible that the inflated cost will sway congress to cut NASA’s funding. NASA typically puts most of its money into the manned program – there will never be bucks without Buck Rogers – and with the overall budget cut, the unmanned planetary end of things is likely to suffer most. This could put a hold on any Mars missions and set the decadal goal back. Congress is still waiting to finalize NASA’s budget for the fiscal year 2013, which means in the mean time the organization can’t start any missions. It can’t award contracts to private companies or NASA centres like JPL to build the next missions’ orbiters and rovers if it has no guarantee the funding will come through. 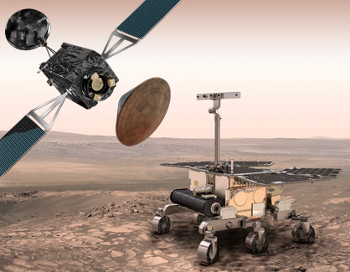 The delay in NASA’s finalized budget is also affecting ESA’s commitment to the 2016 ExoMars program. The joint ESA and NASA missions are not independent, and the ESA is unlikely to fund the its portion if NASA can’t commit to funding its share. The problem here lies in timing; the ESA’s budget is coming up for discussion before congress is likely to make its recommendation on NASA’s budget. It seems unlikely that the missions would be cancelled altogether. A more probable outcome is that various problems would push back each mission. With launch windows once every 26 months, a complicated and innovative landing system, and budget concerns, it’s easy to see how the next ten years on Mars could easily become twenty. This is turn could push back any plans for a manned mission to the red planet. But like all programs NASA and the ESA undertake, they are designed to work both technologically and in terms of schedules. 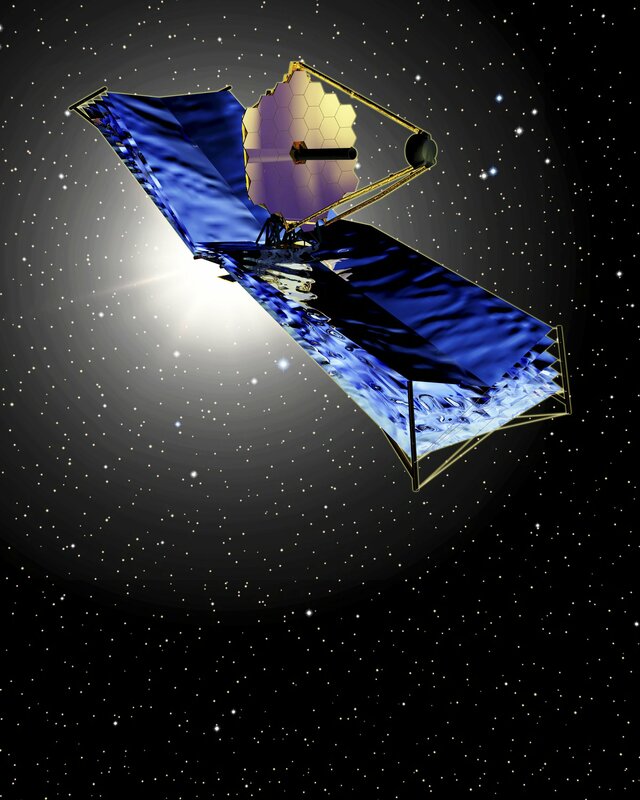 MSL will kickstart the decadal program when it launches in November. We’ll have to wait and see how everything goes. Evidence of Ancient Life in Martian Meteorite, NASA. James Webb Space Telescope, NASA. Next NASA and China: Another Space Race? I wouldn’t be too concerned with MSL new landing system, the Sojourner/MER system was new too, as well as the Viking system at the time (IIRC). But of course there is still some estimated 5 % risk of brake, descent and landing failure, I think. 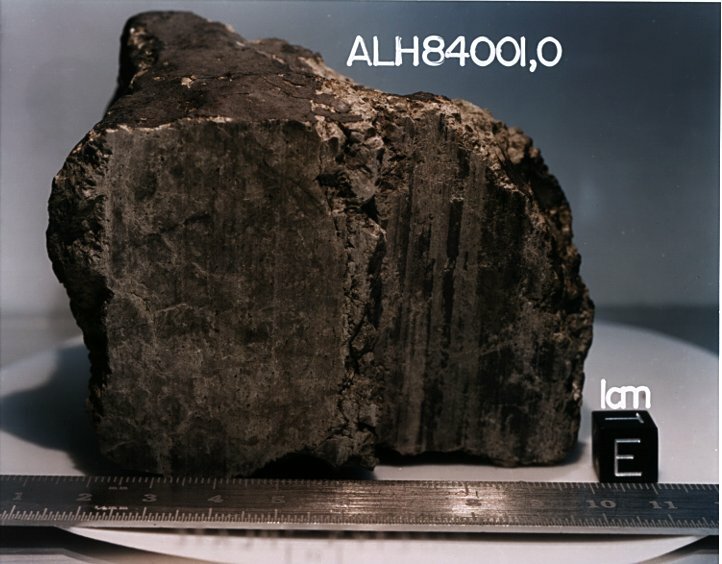 “the meteorite from Mars that held evidence of fossilized bacteria” – that held _purported_ evidence. I don’t think very many believes the scientists involved managed to convince of fossilized life. And that hasn’t changed. 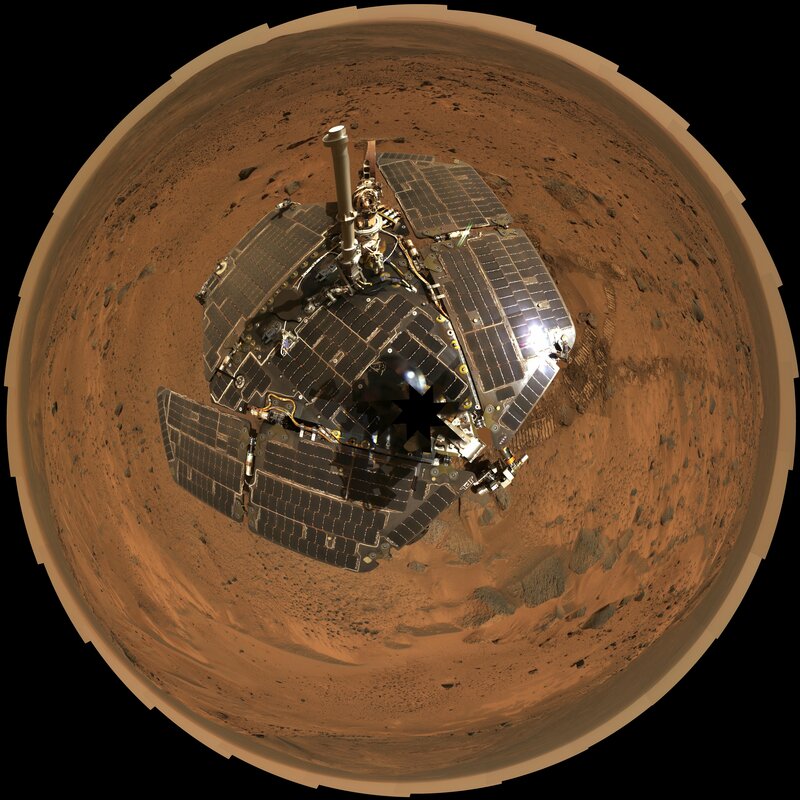 As I remember it they estimate Curiosity may eventually travel twice as fast as the MERs, as the software is upgraded. But presumably it will start out as slow, essentially having the same routines as the MERs have.